Last week word got out that Google is working on two smartwatches of its own, both of which will (obviously) run Android Wear. At that point we heard some details about the devices, but no pictures accompanied that leak. Today, however, from the same source come the renders you can see below, which are said to accurately depict the designs of the watches. To the left is the higher-end (and bigger, and thicker) one codenamed Angelfish, while on the right you can see the wearable codenamed Swordfish, presumably the more affordable of the duo. We're still using the codenames here because it's unclear what branding these will launch with - Nexus, Pixel, or even Google are all options. Angelfish has a large crown button, as you can see, flanked by two smaller buttons above and below it. As mentioned before, this watch's strap design apparently won't allow for use of the Mode Android Wear bands. Swordfish should, on the other hand. Unlike Angelfish, Swordfish has a gently curved bezel, but it's also got a black gap between where the watch body ends and where the visible display area begins. 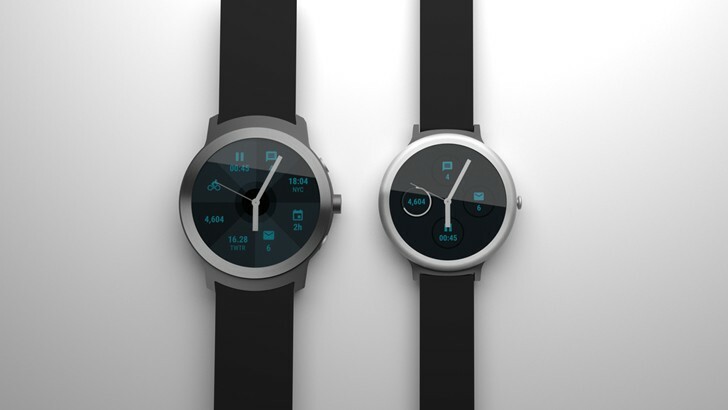 A circular bezel, if you will - possibly chosen to avoid going with a 'flat tire' design like Motorola. Angelfish will come with GPS, LTE, and a heart rate monitor, while Swordfish will not have GPS or LTE, and might even drop the heart rate sensor. What should be noted here is that the designs of the watches may have changed at some point in their development cycle, so don't take any of this for granted just yet. The images above are recreations based on source material that isn't shared. Also, there's still no information whatsoever about a possible release date for these products nor anything regarding their pricing.